On October 9 at 10 a.m. Eastern (7 a.m. Pacific) time, Google will kick off its third annual “Made by Google” hardware event. Unlike in previous years, the Mountain View company is hosting a press conference in New York City rather than San Francisco (with concurrent events in Paris, London, and Germany), and it seems there will be a few surprises in store for the Big Apple. Or perhaps not. A veritable flood of leaks over the past year have painted a pretty detailed picture of what to expect Tuesday. New flagship smartphones in Google’s Pixel lineup — the Pixel 3 and Pixel 3 XL — are a given. We’ll likely see Google Home Hub, a first-party Amazon Echo Show-like smart display powered by the Google Assistant. An upgraded Pixelbook is a shoo-in, as is the Pixel Slate, Google’s first Chrome OS tablet. And refreshes of Google’s wireless Pixel Buds and Chromecast devices are well within the realm of possibility. Above: The Pixel 3 XL. The Google Pixel 3 and Pixel 3 XL are two of the most leaked phones in recent memory, and that’s putting it lightly. They’ve been unboxed in Hong Kong, inadvertently previewed by Google’s Pixel Tips app, “reviewed” by several blogs (including Engadget), and caught on candid camera in trains, showrooms, hotel lobbies, and a Lyft. There’s not much we don’t know about the Pixel 3 and 3 XL at this point. From the renders and photos that have surfaced so far, there’s not much to distinguish the two HTC-made smartphones from each other aesthetically. Both retain the two-tone rear finish characteristic of Pixel devices, with a thin horizontal line bifurcating a narrow glass segment from the aluminum unibody. Around back beneath a fingerprint sensor, there’s a Google logo, and near the top-left corner sits a 12.2-megapixel front camera with laser autofocus, dual phase detection, and support for up to 4K 30 frames per second video recording. On the front of the Pixel 3 and Pixel 3 XL, there’s 18:9 aspect ratio AMOLED screen with a 2,160 x 1,080 pixel (2,960 x 1,440 pixel in the Pixel 3 XL’s case) resolution, a bottom bezel that houses one of two front-facing loudspeakers, and a sizable top-middle notch (on the Pixel 3 XL). The Pixel 3 XL’s notch, speaking of, makes room for dual front-facing 8.1-megapixel cameras, one of which has a wide-angle lens and a variable f/1.8 and f/2.2 aperture. Rumor has it they’ll power new face-retouching and zoom capabilities. Active Edge makes a return. Like last year’s Pixel smartphones, the Pixel 3 and 3 XL have touch-sensitive bezels that trigger the Google Assistant when squeezed. Well, thanks to benchmark results published online earlier this year, we know that both phones pack Qualcomm’s Snapdragon 845 system-on-chip, Adreno 630 graphics processing unit (GPU), and 4GB of RAM. The Pixel 3 and Pixel 3 XL have 2,915mAh and 3,430mAh batteries, respectively (both of which support wireless charging), as well as Bluetooth 5.0, NFC, fingerprint sensors featuring Google’s Pixel Imprint tech, and the Pixel Visual Core, Google’s custom-designed image coprocessor. The Pixel 3 and Pixel 3 XL will come in 64GB and 128GB flavors and at least three colors, including Just Black, Clearly White, Not Pink, and mint green. And they’ll ship with wired earbuds, a USB-C-to-3.5mm adapter, a Quick Switch adapter, and an 18W wall plug. A new Pixel accessory might launch alongside the Pixel 3 and Pixel 3 XL: the Pixel Stand. Judging by leaked press renders, it’s a vertical dock with a round base that conceals a USB-C port. It seems to be made out of grippy rubber or silicon material, and a listing in the FCC’s testing database spotted by 9to5Google lends credence to rumors it’ll support fast wireless charging (9V ⎓ 2A and 5V ⎓ 3A). The Pixel Stand might do more than juice up your phone. Some sources suggest it’ll enable Google Assistant functionality a la the recently introduced Show Mode on Amazon’s Fire HD 8 and Fire HD 10 tablets, and possibly a slideshow feature that will cycle through pics in your Google Photos gallery. Google debuted its smart display platform — hardware devices with visual elements like cards and carousels, Google Duo videoconferencing, and native YouTube, Google Photos, and Google Maps integration — at the 2018 Consumer Electronics Show in January. The intervening months have seen launches from Sony, Lenovo, JBL, and LG, and rumor has it Google’s working on a first-party offering dubbed the Google Home Hub. At 480 grams and 7.02 x 4.55 x 2.65 inches, the Google Home Hub is a bit more compact than JBL’s Link View and Lenovo’s Smart Display. Leaked product renders show an oblong, fabric-clad base affixed to an angled plastic, tablet-like 7-inch display with stereo speakers and ambient light and color sensors. On tap appear to be two physical switches — potentially a volume rocker and a privacy switch that prevents the Home Hub from inadvertently picking up voice commands. Under the hood, the Home Hub has a Bluetooth radio, 802.11b/g/n/ac Wi-Fi in both 2.4GHz and 5.0GHz bands for “high-performance streaming,” and a far-field microphone array. And on the software side of things, it will offer features comparable to smart displays already on the market, including (but not limited to) language translation powered by Google Translate, search results for local businesses, podcast playback, a daily news digest, sports score updates, and control over the more than 5,000 devices and 400 brands that play nicely with the Google Assistant. Google Home Hub will come in two colors, Chalk and Charcoal, when it ships on October 22, and a leaked retailer listing pegs the price at $149 — a whopping $100 cheaper than the JBL Link View and $50 cheaper than the Lenovo Smart Display. New smart displays and phones aren’t all Google has in store. Two Chrome OS devices — the Pixel Slate, a tablet, and the Pixelbook 2, a follow-up to last year’s Pixelbook Chromebook — will reportedly make their debut this week. Leaked renders of the Pixel Slate show a slim, sleek, and minimalist device with a 3,000 x 2,000-pixel, 3:2 aspect ratio screen that will work with new and old Pixelbook Pen styluses; front and rear cameras; a physical volume rocker on the left-hand side; and two USB-C ports. Also onboard are ambient light sensors and proximity sensors, as well as a top-mounted fingerprint sensor that’ll be the first to support a new fingerprint authentication feature spotted by 9to5Google. If the benchmarks circulating online are any indication, the Pixel Slate could come in as many as four models: a low-end SKU with an Intel Celeron 3965Y clocked at 1.5GHz; two mid-range variants with Intel Core m3-8100Y and Intel Core i5-8200Y running at 3.4GHz and 3.9GHz, respectively; and a top-tier model with an Intel Core 8500Y with a 4.20GHz clock speed. The first three will ship with 8GB of RAM, with the fourth bumping the cap to 16GB. Above: One of the Pixel Slate’s rumored keyboard accessories. 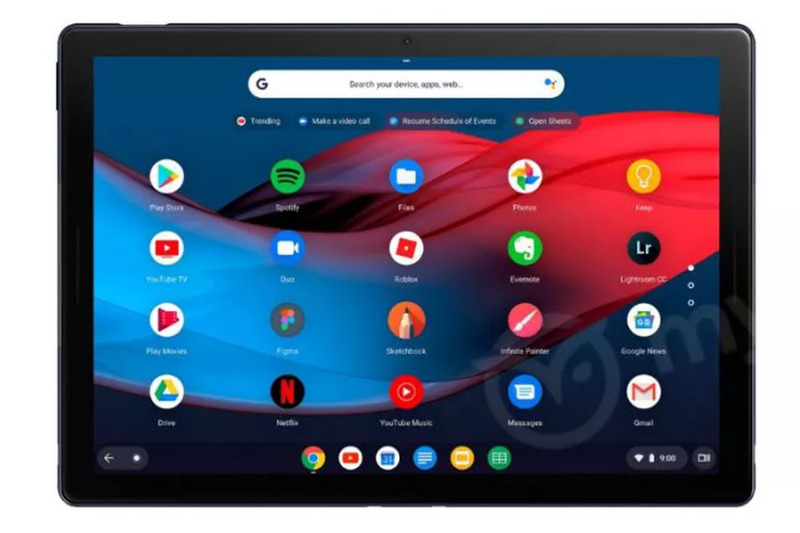 The Pixel Slate’s software looks to be bone-stock Chrome OS for the most part, but with two rumored twists: a Google Camera app (ported from Android) with Portrait mode — a shooting mode that blurs the background while keeping the foreground in focus — and a dual-boot feature that supports Windows 10. Benchmark results show prototype devices running “Android 9” Pie, indicating that Chrome OS’s Android subsystem will finally see an update from Android 7.1. The Pixel Slate is set to launch with a bevy of accessories, including a detachable single-tone keyboard stand with a built-in touchpad and uniquely rounded, circle-shaped keys and a third-party hinged keyboard from Brydge that adapts the Slate to a laptop-style form factor. The successor to last year’s Pixelbook — potentially codenamed “Atlas” — is shaping up to be less a reimagining than a refinement. The Chrome OS notebook retains its form factor and ports (two USB-C ports and a headphone jack). That’s not to say it’s devoid of upgrades. 9to5Google reports it will have a processor either from Intel’s Kaby Lake or Amber Lake families, an NVMe solid state drive, and a 4K display (up from the 2,400 x 1,600 pixel resolution of the first-gen Pixelbook), plus a front-facing camera that can capture 1,080p video at 60 frames per second (up from 720p). Google’s second-generation Chromecast was released way back in September 2015, and all signs point to an impending refresh. One lucky customer reportedly managed to nab one early from a Best Buy, pictures of which he promptly published online. They reveal a slightly tweaked design more or less in line with the current aesthetic, complete with a flexible, flat HDMI cable, a micro USB connector, and round housing — albeit with a matte finish instead of the currently available model’s shiny plastic. An FCC filing from May points to Wi-Fi improvements and the addition of Bluetooth Low Energy (LE) connectivity. Android Police pegs the Wi-Fi gain at 5GHz to be somewhere in the neighborhood of 55 percent, and Bluetooth implies support for remote controls, game controllers, and other peripherals. There’s some speculation the upgrades lay the foundation for compatibility with Google’s Project Stream cloud gaming platform (referred to internally as “Yeti”), which requires an internet connection capable of 25 megabits per second, but so far, supporting evidence has been hard to come by. In any case, the new Chromecast is expected to go on sale October 9. Barring any last-minute leaks, it appears it won’t ship alongside an updated Chromecast Ultra, an upmarket Chromecast variant that supports 4K HDR content, or Chromecast Audio, an audio-only model that enables multiroom streaming on legacy speakers. Google’s lineup of Google Assistant-powered smart home speakers — Google Home, Google Home Mini, and Google Home Max — might see a refresh or a price drop, particularly in light of Amazon’s recently announced 2018 Echo lineup. A surer bet is a new SKU — the Smart TV Kit — that packs a Chromecast and Google Home Mini into a single bundle, pictures of which leaked earlier this month. It’ll reportedly be a Walmart exclusive, but mum’s the word on availability and pricing. Above: Google Pixel Buds on display at the Made by Google hardware event held October 4, 2017 at the SFJazz Center in San Francisco, California. Last year’s Pixel Buds — Google’s first attempt at truly wireless earbuds — are something of a disappointment. The fabric charging case is a bit chunkier than the competition; their bulky tips don’t sit comfortably in the ear; and unlike wire-free earbuds like Apple’s Airpods, they’re tethered together by a cable. Luckily, Google is reportedly planning to announced next-gen models this week. Details on the Pixel Buds 2 have been hard to come by, but we’re betting they’ll at the very least boast the same features as last year’s models, including the ability to translate 40 different languages, access to the Google Assistant, auditory notifications, hands-free phone calls, and turn-by-turn directions. What else might we see announced at Google’s October 9 event? Last year’s AI-powered Google Clips camera could see a refresh or a price cut. News on Google Wifi — Google’s mesh home networking system — isn’t out of the question, considering it’s been two years since the current kit went on sale. We’re counting on software upgrades for existing Google Home and Chromecast devices, and potentially more details about Google Coach, a rumored AI-powered wellness service. And who knows — perhaps we’ll hear more about Google Duplex, Google’s eerily humanlike reservation service that can book haircuts and restaurants over the phone on your behalf; Daydream, Google’s virtual reality platform; and ARCore, its augmented reality framework for Android and Chrome OS. One thing that won’t make an appearance? A smartwatch. Google confirmed to Tom’s Guide this summer that it won’t be releasing a wearable this year. That’s just as well — Qualcomm in September unveiled a vastly upgraded smartwatch chipset that promises to more than double smartwatch battery life.